I kind of can’t help myself but love these. A more traditional romantic one. Would make for an awesome valentine’s day card! Plays to the inside joke of “riding the goat”. I like this one in particular, because I think it speaks volumes, without really saying much at all. 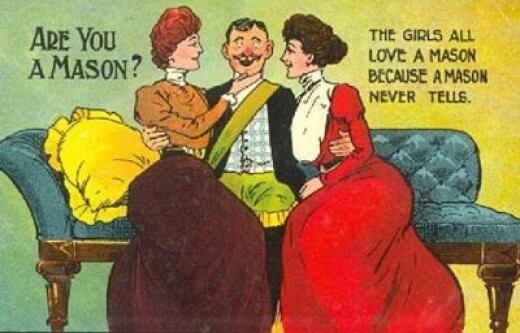 Apparently women in the 1900’s were really worried about their beau giving away all their secrets. 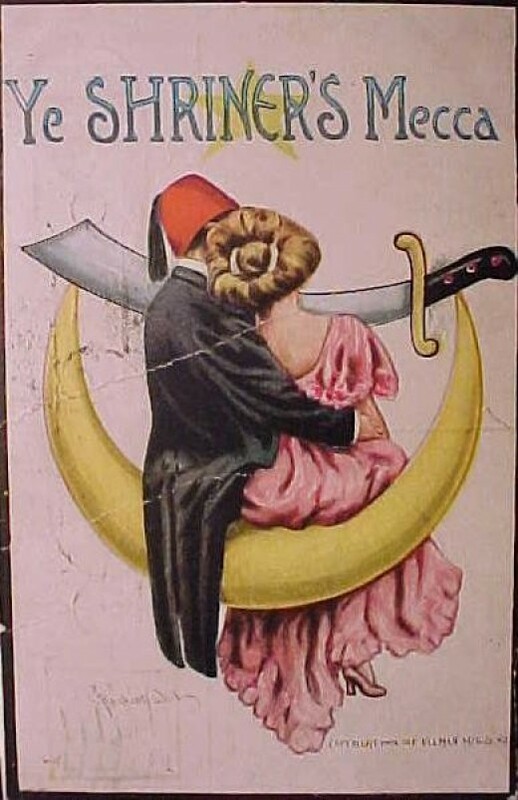 Not often seen, a Shriner postcard. Seriously, what are these women hiding? I’m kind of starting to wonder what the big secrets were for women in the 20th century. Either it was completely mundane, or absolutely off the wall. Of course, it wouldn’t be complete without us poking fun at ourselves. I know that wasn’t what you usually see here, but thanks for checking it out all the same! On that note- Have a great week! I hope that everyone’s weekend was as awesome as my own! 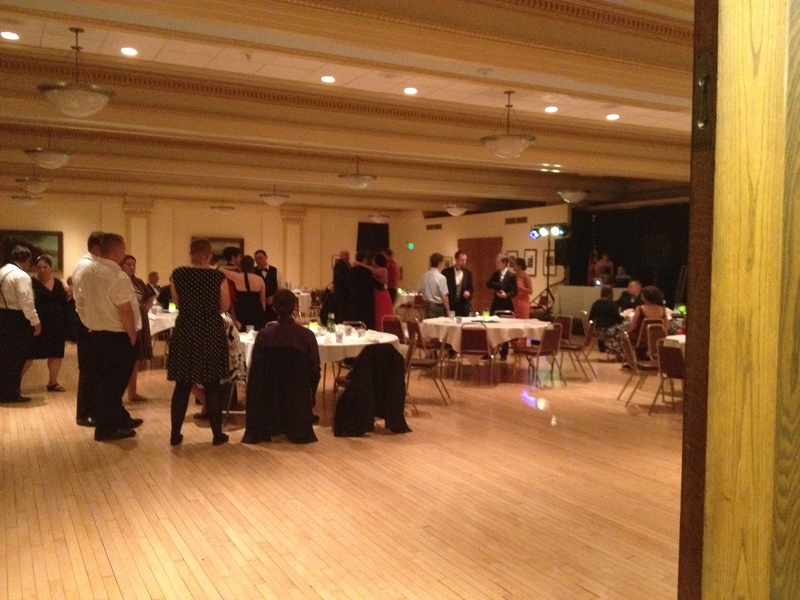 On Saturday, T and I hosted a Master Mason’s Ball downtown at our Scottish Rite Center. 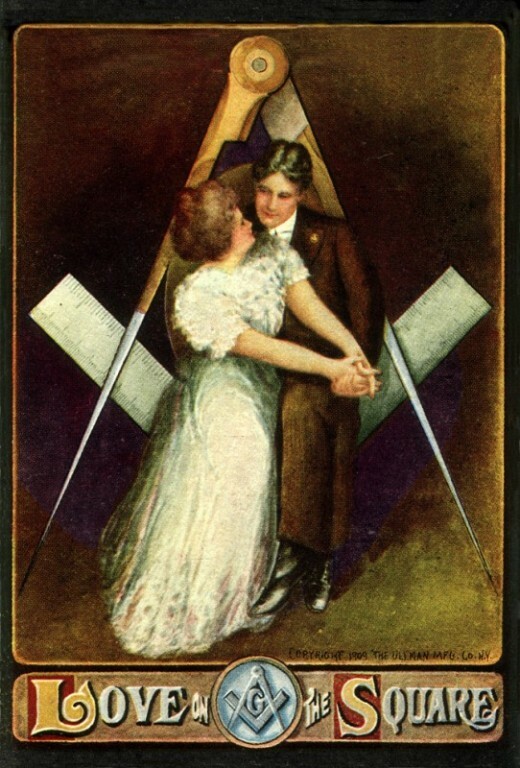 From what I can gather, many balls and other formal dances have fallen out of favor, not only within the Masonic community, but also general society. I would encourage you to talk to your Worshipful Master about your Lodge having one, or encourage your Mason to host one during his time in the East. From what I can find, there is no history of the Master’s Ball; I am not even sure that they happen in other jurisdictions. That being said, I can tell you a bit about it. The concept is very simple: everyone in the Lodge gets dressed up, and gets together to have a good time, and to honor the current and past Worshipful Masters of the Lodge, as well as any other dignitaries that may show up. It is a public event, so non-Masons are welcome as well. It’s more or less an excuse to get really dressed up, and have a great time. So, while I cannot tell you the universal way that Masons do the Master’s Ball (if Masons did anything universally I would be surprised), but I can tell you what we did for ours, and hope to inspire you to have your own. Some brothers dancing the night away. Masons love to get dressed up, and I can see why. How many opportunities do you really get to do it in a year? I mean floor length dress or tuxedo, getting your hair done, etc. Maybe one or two for most people, and those are usually weddings. T decided early on that he wanted the attire to be semi-formal to formal. He wanted his attending officers to be in tuxes, and at least a jacket and tie for everyone else. I believe jacket and tie was the attire put on the flyer, and his officers were told privately to wear their tuxes. What we got was people wearing everything from jeans (a DeMolay who came last minute) to floor length ball gowns (myself) and everything in between. It would have made for a very awkward looking group photo. If you’re going to an event, and not sure if your attire is appropriate, ask someone who is putting on the event, or err on the side of overdressing. 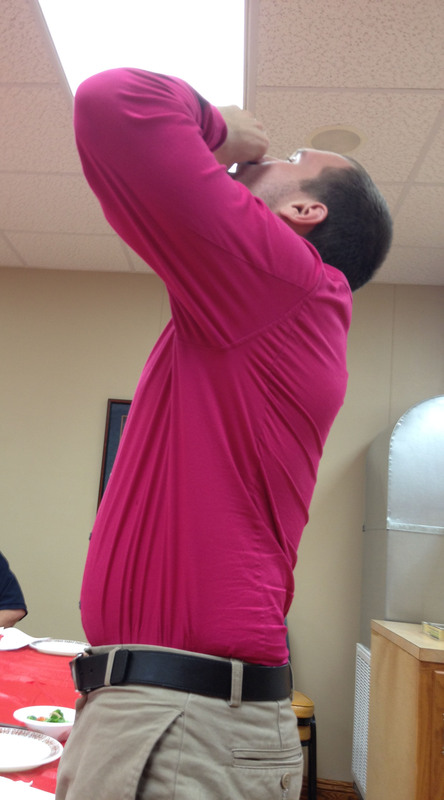 The DeMolay who wore jeans…and then made me promise to post this picture. Luckily for us, we live in a large metropolitan area, and have a beautiful Scottish Rite center down town. The entire venue is gorgeous- marble staircases, hardwood floors, they were even repainting a ceiling in a small sitting room with gold leaf! The ballroom we held the event in was no exception. The small amount of information gathering I was able to do lead me to the conclusion that Master’s Balls simply are not done anymore; which in my mind, is more reason to have one. This really gives you a lot of leeway as far as things like venue are concerned, because no one has any preconceived notion of what the ball has to be. While I would not recommend using your lodge, as it might not feel quite “special” enough, and may also not be big enough; your local Shrine center may have the perfect spot for your dance. 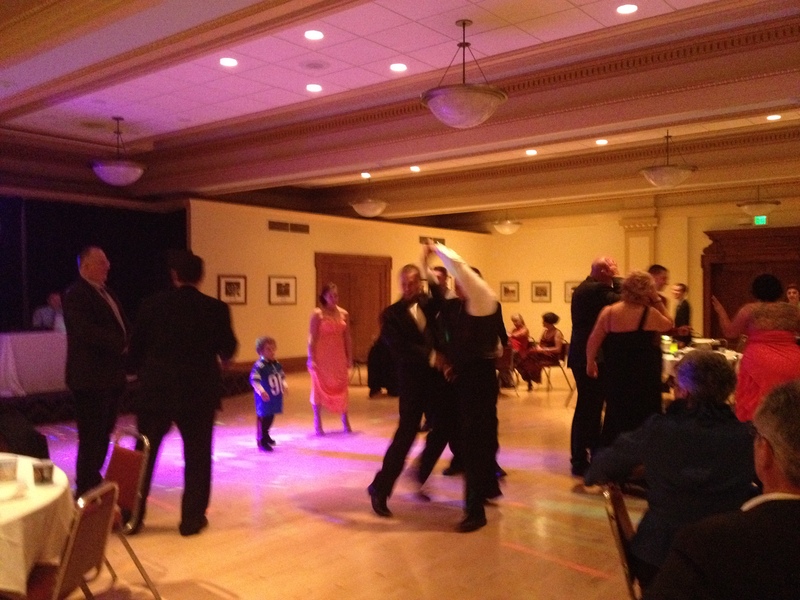 Although our Master’s Ball was only two days ago, we had begun preparing for it as soon as T became Worshipful Master. He knew it was something that he wanted to do, especially because his Lodge had not hosted one for six or seven years. Our Grand Lodge is very early; most are in the summer, while ours is in early February. We knew that we wanted to have tickets printed to sell by that time, and they were just barely done. As we all know, a good deal of drinking tends to go on at Grand Lodge after the business is all taken care of, and we used this to our advantage to sell more tickets. In addition to this, our large Masonic family in Omaha has a universal calendar sent out every month, and we were sure to add the ball as soon as we had a date set. Action shot of our beautiful venue. Although we booked the venue well in advance, and let them in on the plan, there was not much to do up until about two months before the event. Around June, T started reminding brothers that the Ball was coming up, how much tickets were, who to talk to, that kind of stuff. I created a poster that hung at the Shrine and other Masonic centers in the area. Some of the other lodge members and their wives took care of contacting the caterer (who was also a brother), those that would be setting up the tables and bar (a brother), taking care of appetizers, and other related items; while T got ahold of the DJ (you guessed it, a brother). When we got there the day of, all we really had to do was place the centerpieces, help the DJ get situated, set up the appetizers, and get ready ourselves. 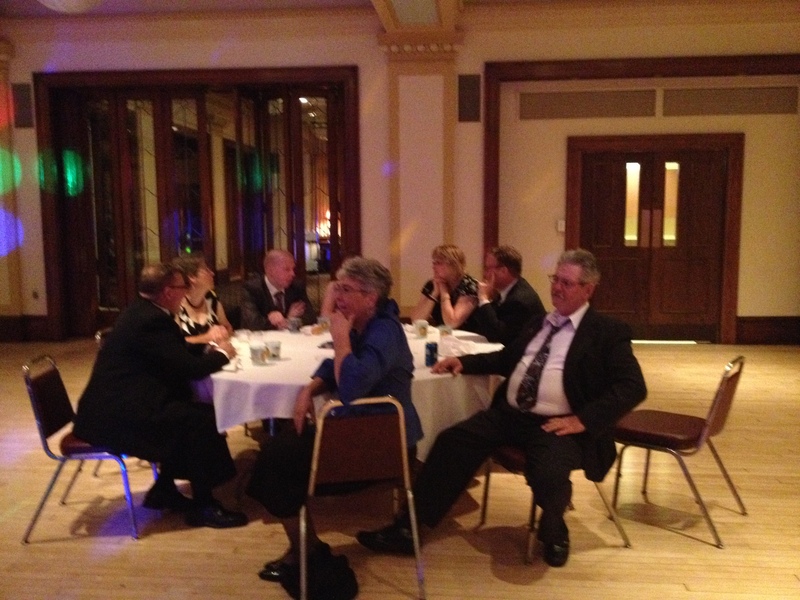 The evening started, as many Masonic evenings do, at the bar. We opened the doors for cocktail hour (and a half) at 6pm. T and I had decided to invite many of our non-Masonic friends, and my family had come in from out of town as well. It was wonderful to see everyone socializing and getting along so well. As I said previously, we had a large range of attire, but really, the point of the evening was to be with our friends and family, and have a good time, so we were not about to turn anyone away (save for the confused man who showed up without his pants). We had a nice dinner, catered by a brother, as I said previously. T had decided early on that it was simply better to just not give anyone a choice as far as the protein was concerned, and so, everyone had chicken and salmon. This did lead to some confusion, since it’s not normally done that way, so many people who called to buy their tickets still told us which one they wanted. Oh well. After dinner, T took the time to thank everyone for coming, thank the families from the lodge who had put work into setting up the ball, and recognizing those who were Past Masters, not only of his Lodge, but also those who had come in from other area Lodges. We were lucky enough to have a few Grand Lodge officers there, including the Deputy Grand Master for our state (aka, the guy who is going to be Grand Master next year). Our special visitor, to help us celebrate. The rest of the evening, the whole evening, was very relaxed. Although all of us were in our formal attire, most everyone there knew each other, and so really it was just a fancy party with all of our friends. The ball continued late into the night, with about as much drinking and dancing as you might expect; a lot and, not quite as much. If anyone’s Lodge hosts a Master’s Ball or something similar, I would love to hear about it. If yours does not, encourage your Mason or Worshipful Master to bring it up at a business meeting. While it is not profitable, and indeed, we operated ours at a loss, sometimes you just need to put on your fanciest outfit and have a nice dinner with your friends; it’s all about having fun! Picture this- it’s Lodge night, your Mason isn’t due home for a few hours, the kids just got to sleep, and you finally have some time to yourself, to do what you please. Sounds relaxing, doesn’t it? Lodge nights always give me the eerie feeling of stepping back in time, when a woman stayed home with the children, and the man worked, say like, the 1950’s. There is a very good reason for this. Masonry, which became popular in the late 50’s and early 60’s, tends to reinforce the very traditional gender roles from that era. Just what does that mean, anyway? Gender roles are “the social and behavioral norms that are generally considered appropriate for either a man or a woman in a social or interpersonal relationship”. In other words, gender roles are the way that you act, because society tells you that you should, or it’s the agreement between you and your spouse, or it’s the way your culture says that you should act, based on your gender. For instance, the way that a woman from a very traditional Muslim family acts in public, is very different from how a man from that same family acts in public, and both act very differently from the way that a woman from a loosely Christian household might act in public. They aren’t right or wrong, they just vary from person to person for any number of reasons. 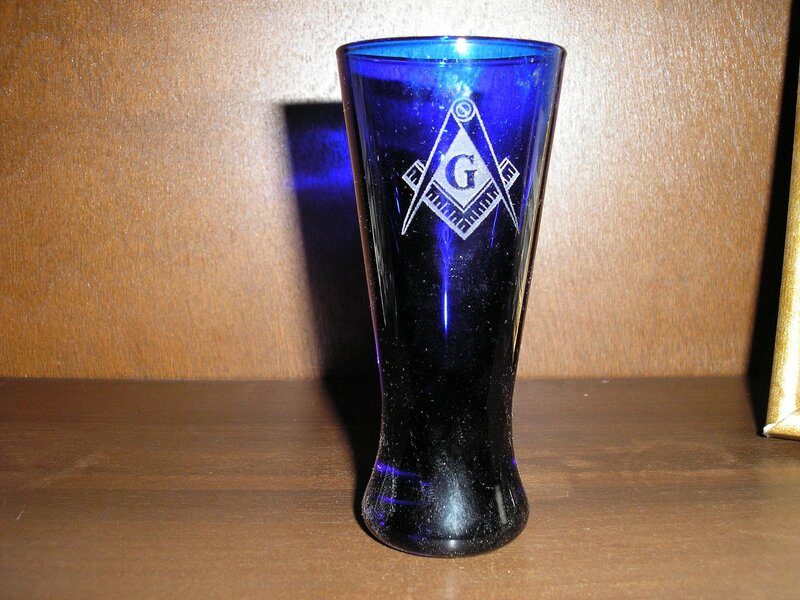 What does this have to do with Freemasonry? The scenario above depicts very traditional Western gender roles that is, the husband goes to work, while the wife stays home and takes care of the 2.5 kids. Add a white picket fence, and its practically the American dream. Freemasonry gives us many things. It gives us tradition, ritual, a sense of self, a way to give back to the community, amongst other things. If you notice, however, one of the things it does not give us is change. Freemasonry is very rooted in it’s ways, and tends to be very “this is the way it is, because this is the way that it always has been”. No one can seem to agree on exactly when modern Freemasonry began, but it is agreed that it was around the turn of the 20th century. Let’s think about life in the early 1900’s. Radio and cinema were still in their infancies, many people still had servants, and save for a small group of women, the ladies of the house chose to stay home while the men worked. When creating something as complex as Freemasonry, you will, of course, want to be able to integrate it into your life, as well as future member’s lives as easily as possible. Since women staying home was the norm at the time, perhaps this was a factor in the exclusion of women from Freemasonry during its creation. Staying home was expected of women at the time, it was the typical gender role, and Freemasonry simply stayed the course of society at the time. These gender roles stayed true throughout the years, including during the 1960’s, when Freemasonry had its first big boom. Women were beginning to enter the work force more regularly, but in very submissive roles, such as secretary, and many women continued to stay home while the man of the house worked. Again, Freemasonry was easily integrated here, because it supported the gender roles that the society, for the most part, continued to dictate. In addition to a rise of Freemasonry membership, Order of the Eastern star and other women’s auxiliary groups saw an influx of members. Perhaps some of this can be attributed to the fact that women were becoming more independent, and more likely to work out of the home and do their own thing. The continued separation, however, continued to support the way that things always had been. Many have said that we are currently in another membership boom for Freemasonry, and I am inclined to agree with that. What is different now, is that gender roles have changed, which causes some tension on the topic of women and Freemasonry. Women no longer stay at home and care for the home and children as the norm, in fact, this tends to be abnormal. Families now aren’t known to just be a man, a woman, and some kids, but instead made up of numerous combinations. Yet, Freemasonry supports the same gender roles. the same societal roles as it did during its inception the Mason goes to lodge, and the non-Mason, being excluded, does their own thing. I feel that this is a growing issue in Freemasonry, and will continue to be an issue until more lodges choose to do something about it. 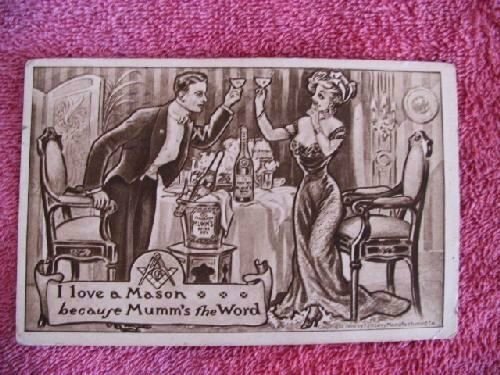 Many have, doing things such as inviting the women to lodge dinner, having free wi-fi and cable in a lodge lounge, and generally trying to make lodge night as welcoming as possible to all members of a Mason’s family, not just the Mason himself. So, this is a bad thing right? Yes and no. Yes, I think that propagating traditional gender roles, whether consciously or not, is harmful to Freemasonry, and will turn off a lot of potential younger members. I also believe that all organizations should be somewhat flexible in “getting with the times”. I am not calling for a radical reformation of the way that Freemasonry works, I just think that small things could be done to make it a bit more welcoming for the rest of the family. This is most easily done on a lodge by lodge basis. That being said, I think that viewed in the correct light, the traditional gender roles that Freemasonry promotes can be a very good thing. Go back to the scenario at the beginning of the article. Now, imagine that you are a woman in the 1920’s. Your husband leaving for lodge on a regular basis give you two things you might not usually get at that time independence, and autonomy. In fact, organizations that excluded women around this time, helped women actually join the workforce, and eventually join (some) of those organizations. In part, being excluded and away from your husband when all the chores were done and the kids were asleep, forced women into a kind of sink or swim scenario, either they had to gain the confidence to be seen as a separate person, or they could hide back in the shadows. The former is what a lot of women chose, shown by the boom of the women’s auxiliary and independent groups. Speaking more modernly, I feel that the exclusion for one partner in a relationship can also be healthy for that relationship. If you know that your partner is going to be gone for 4 hours every Wednesday, you can plan things that they might not want to do with you, or things that you only want to do for yourself. When T is at lodge, for instance, I will often go to the gym, then come home and cook myself a nice meal, not having to worry about having to share, and then watch a horror movie, or play some video games. I think that the regularly scheduled time apart helps get rid of the “omg I want to strangle you right now” feeling that we all get in relationships sometimes. These are just my thoughts and observations, as with anything on the internet, please take it with a grain of salt. That being said, I would love to hear what anyone has to say about the topic. I do not mind at all if you do not agree with me, I just ask that you remain respectful! This week is a little crazy- my birthday is tomorrow, and I have two exams, as well as working during the week, so I apologize if you have seen this before (you will if you followed me here from Reddit), but my free time is a little short this week. We will be returning to your regularly scheduled programming next week, with an article on the first known woman to become a regular mason. (Yes, you read that right!) One last bit before I get started, in case you don’t read this- I started a twitter account for this blog, check it out at @themasonslady , and say hi! 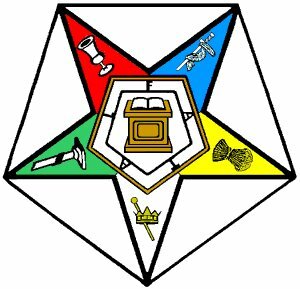 The Order of the Eastern Star (or Eastern Star, or OES), is the world’s largest fraternal organization that can be joined by both men and women. It is a member of the Masonic family, but joining does not make a member a mason. It’s more of an axillary group, that supports masonic lodges, masonic youth organizations, as well as their own agenda. Like all Masonic organizations, they support membership when in need, both financially and emotionally. They also provide a framework for introspective thought and philosophical discussion on ethical and spiritual topics. In order to be eligible to receive the degrees of Eastern Star, a woman must be a: wife, daughter, adopted daughter, mother, widow, sister, half sister, granddaughter, stepmother, stepdaughter, stepsister, daughter-in-law,grandmother, great granddaughter, niece, great niece, mother-in-law, sister-in-law, or aunt of a Master Mason in good standing. (Basically, if you can prove you are in some way or another related to a Mason who is paid up, you’re in.) Former members of Job’s Daughters and Rainbow Girls are also eligible to join. Men wishing to join the order must be Master Masons. All members must be at least eighteen. How do I join OES? Step 1) Find a chapter in your area. Step 2) Ask for a petition, fill it out, return it. Step 3) Interview with members of your prospective chapter. But, what do they *do*? I can’t answer for other chapters, only for what goes on in Nebraska. In Nebraska, OES is the majority supporter for the Masonic youth organizations- Job’s Daughters, Rainbow Girls, and Demolay. They also operate the Masonic-Eastern Star Home for Children – a place for kids who are either wards of the state or are having other troubles. They also provide scholarships to college students and support other minor charitable efforts in their respective local areas. What about the degrees? Is there memory work? There are five degrees, received in one night. There is no memory work required for initiation. There is, however, memory work involved if you would like to be an officer. Why did you chose to join? Eastern Star was very important to my great-grandparents; I never got to meet any of them, so this is a way for me to connect with my family’s past. I can now say I have walked the same path my great-grandmother did, almost 100 years ago. I also think that it is a great way to connect with T, as a lot of the rituals are similar to what they do in lodge. I cannot, of course, share any of the secret work with him, just has he cannot share his with me; I think its kind of nice to have my own masonic secrets. Does there have to be a guy involved? It’s not the way that I would have it set up, but yes. MMs are involved in a number of different ways. There’s two male only officer positions that they can hold- Worthy Patron and Associate Worthy Patron. My chapter current has a MM also sitting the position of Chaplin, Sentinel (Tyler), and I was lucky enough to have a MM who is a good friend of mine as Host (I’m not sure if blue lodge does this- he sat with me before I was called in, and after my initiation, to help me with the rest of the meeting, introduced me to people, etc). I’m not sure about the rest of the positions, I know that the points and matron positions must be held by women (obviously), but I don’t see why a MM couldn’t be say, treasurer, or secretary. Otherwise, MMs are full, voting members, but it does tend to be a bit of a role reversal, the MMs are there to support the sisters, the girls run the show here. I was orginally upset about this fact, that a man must be there in order for a chapter of OES to be open. Now that I am a member of Eastern Star, I realize, I was looking at it all wrong from the beginning. In the Blue Lodge, the MM does his work, with support from his wife. In Eastern Star, the opposite is true, the Sister does her work with the support of her husband. MMs are present in the Star, but it is a support role, the women are truly the ones in charge here. Much of my offense was simply ignorance, but I believe it to be one of those things you cannot really get over until you are already in. If you still disagree with this, there are women’s only orders within the masonic family. There is kind of a huge stigma involving OES within the masonic family. When I told our masonic friends I was joining, everyone had something to complain about it, mostly about how boring it was, and how much marching there was. I ignored them, I wanted to find out for myself. Yes, it is true that watching grass grow would be more exciting than listening to a chapter open. However, I think that there is a lot of wiggle room for change, and that your chapter is what you make of it. I would love to change people’s thoughts about OES, and make it something more attractive, something at people will want to join. If you are reading this right now, chances are you are in the “next generation” of masonry. We are the ones that will bring about the positive change to this organization. I also believe that if we do not, it will be gone in the next 20 years. I’m going to cut it a bit short and leave it there for now. I am planning on returning to the general topic of Eastern Star at a later point, but if you have any questions let me know, and don’t forget to check us out on twitter @themasonslady! Ah, a topic close to my heart, women and masonry. Get comfy, this one might be a long one. So, women can’t be masons, right? Lets start with the latter. No, women cannot join the (Ancient Free) and Accepted Masons, aka Blue Lodge, aka lodge, aka, the stepping stone of Scottish Rite, Shriners, and at least 30 other appendant bodies. Yes, I know. Let me share my perspective on the matter. When I first met my boyfriend, and found out that he was a mason, my first reaction was to be jealous that I could not join, and be offended at the blatant sexism that was happening in an organization that he is so involved in. 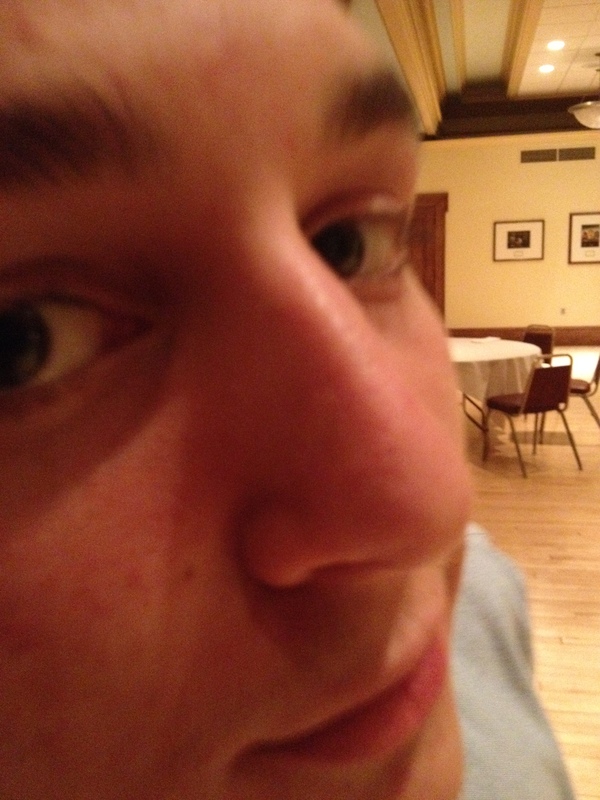 I snooped around, trying to find some loophole or backdoor that would let me into the secret boys club. You see, I am a geek, and I tend to be the token female in many of my geek circles. Being shut out from the boys and having to “earn” my way into the level of acceptance that they hold each other to has been going on for years in my life. So, I was used to this, in a way, but not used to being 100% shut out, with absolutely no way in. As my relationship grew, so did my level of involvement in the lodge. I began cooking meals for degree nights, helping the other women in the kitchen, cleaning up after family meals, going to the Shrine bar after lodge to drink with the boys, going on DeMolay outings, and more. My boyfriend recognized the level of interest I hold, and suggested I look into joining the Order of the Eastern Star.In a way, this was like finding out that I could not become a mason all over again. Women and men can join OES, and they are preceded over by a Worthy Matron and Patron. I again, found it rather sexist, but I was too interested to not look into it. During all of this time, I was discussing all of these feelings with T. He is terribly understanding about it all, but we kind of came to a mutual conclusion. 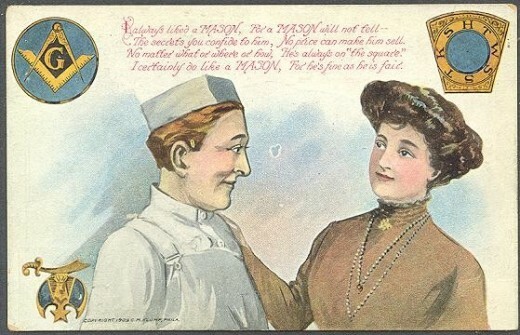 It is healthy for partners in a relationship to have time apart, and masonry became very popular when far less women were independent in their own right. So while I may find some of the traditions to be sexist, it is still just that, tradition, something old. Perhaps our grandparents were onto something? As for the yes- yes, women can join masonry. 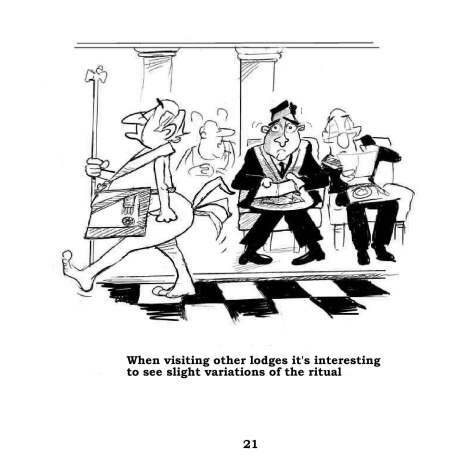 There are lodges that are referred to as irregular, clandestine, or co-masonic. Women can join these lodges, and can become a Perfect Masoness (the lodge’s equivalent of a MM). I cannot claim to know much about co-masonry. I do know, however, that it was originated in France, under the name Le Droit Humain, The International Order of Mixed Freemasonry. It has lodges in over 60 countries, and is continues to be fairly popular in Europe, especially France and Belgium. Today there are a number of organizations that run co-masonic lodges, including Le Droit Humain, The Eastern Order of International Co-Freemasonry, and The Co-Freemasonic Order of the Blazing Star. It can be very confusing trying to find locations of co-masonic lodges due to all of the different groups that run them. There are a number in England, and of course France, Belgium, and the rest of Europe. Those in the United States, however, tend to be in larger coastal cities. If you would like more information, this website has all of the links for every co-masonic, or women’s only lodges. Before you run off to join a co-masonic lodge, I suggest that you stop and think about this. If your boyfriend, your husband, your SO, or even just a friend is a mason, a member of a blue lodge chartered by a regular Grand Lodge in your state or country, he is not allowed to discuss secret masonic work with you, even if you become a master mason (or equivalent). This is because regular, or mainstream lodges do not recognize lodges that accept women as members, solely because of that reason. This is not to say that you can no longer discuss masonry with him. Quite the contrary really, as many regular (“masculine”? saying regular just seems weird) lodges will invite co-masonic lodges for discussion, and there can be fellowship between the two lodges. However, if you are a member of a co-masonic lodge, and your SO is a member of a masculine (I think I like that better) lodge, you cannot attend regular meetings at his lodge. I am not sure if he is able to attend yours. If you are thinking about joining a co-masonic lodge, do your homework!!! There are a number of “scam” lodges that exist, only there to take your money and give you a shiny title in exchange. If you are a member of a co-masonic lodge, please contact me! I would love to chat with someone that is an active member and get their perspective. So, what can I join? There are a number of organizations that you can join that will get you more involved with masonry, that are associated with masculine lodges. Unless noted, you must be 18, and related to a MM. When they say related, it basically means, if you want to join, you will find the relation. I joined OES due to my great-grandfather whom I never met. OES, or Order of the Eastern Star, probably the most widespread organization. I will be doing a more in depth post on this organization later, but I will tell you right off the bat, that it is open to women related to Master Masons, as well as Master Masons themselves. It tends to have a very negative reputation, but as a member myself, I enjoy it a good bit. You can also join if you were a Rainbow Girl, or in Job’s Daughters. Order of the Amarath– Similar to OES, in fact, it used to be that you had to join OES before you could become a member of OA. Again, this is open to women related to MM and MM themselves. Ladies’ Oriental Shrine of North America– Far less prevalent, these are the “lady Shriners”. Only women can join this organization. You must, however, be related to a MM or a Shriner. The Order of the White Shrine of Jerusalem– One of the requirements to join this organization is to profess a belief in Jesus Christ. Again, this is open to women only. Order of Cyrenes– Similar to the Heroines, however this organization is associated with Prince Hall Templars. Daughters of the Nile– This group is associated with Shriners, but is different from LOSNA in that their focus is fundraising, whereas LOSNA is more focused on sociability. Again, you must be related to a MM, Shriner, or a Daughter of the Nile. 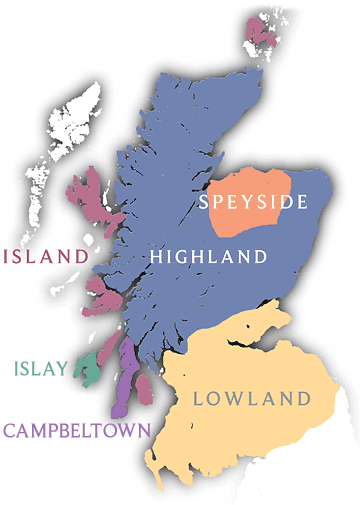 Scottish Rite Ladies- This is not a national or international chapter, but instead depends on your Grand Lodge, or even the Scottish Rite chapter in your area. It tends to be more women getting together and having a good time, that is usually organized by the men (at least here in Nebraska). Must be related to a MM that is a member of Scottish Rite. Order of the Weavers– This is where I get kind of jealous. The Dutch don’t really have any co-masonic lodges, so the ladies decided to make their own body that is associated with masculine lodges. How cool is that! If you have anymore information on this organization, please contact me! The Widow’s Sons Ladies – Mentioned by a member of Reddit, this unique group is associated with the Masonic motorcycle group, the Widow’s Sons. Don’t be afraid to offer to help out around the lodge if you are interested in being more involved! If you’re not into it, no big deal; I know your mason would appreciate your interest. It seems that there are dinners, dances, fundraisers, you name it, almost every night of the week here- we’re not a big city, but there’s 12 masonic lodges, plus a shrine and Scottish rite, star…you get the idea. Even if you live in a small town with only one lodge, there’s bound to be something to do at least once a month. Offer to help cook or clean, or even just hang out with the ladies at your lodge while the meeting is occurring- that’s right, it’s your lodge too, make yourself feel comfortable there! Weekly (biweekly, monthly), meetings are a great place to meet new people with a common interest-it’s really all about socializing after all. Don’t be afraid to ask questions, they will be answered if possible. Ask to see the lodge room, often there will be antique pieces that the lodge owns (I always find that stuff fascinating), ask about symbols you see, ask lots of questions! One last bit of advice. If you are not comfortable with masonry, for any reason, whether your mason is a candidate or a 33rd degree mason, let them know. You might find that your worries were just because you did not know enough, or it might be for another reason. I cannot stress this enough. Masonry can take up a good chunk of one’s social life, and if you are uncomfortable with the amount of time that your mason is spending at lodge, tell him. I cut this topic a bit short, because there is so much that can be said about women and masonry. I will be covering the history of women and masonry at one point.